I’ve mentioned hand pumps for beer in 1930s New York earlier, but would like to discuss the topic in more detail. The above image was taken in 1936 in New York, and is sourced from the New York Public Library’s historical digital collection, here. * It shows a gleaming oak bar softly lit by old-fashioned globe lamps overhead. The equipment was probably pre-Prohibition era, fetched up from a warehouse and dusted off after liquor became legal again in 1933. Perhaps the location was an old saloon boarded up during the ban, or turned to another use and then back to a bar after Repeal. 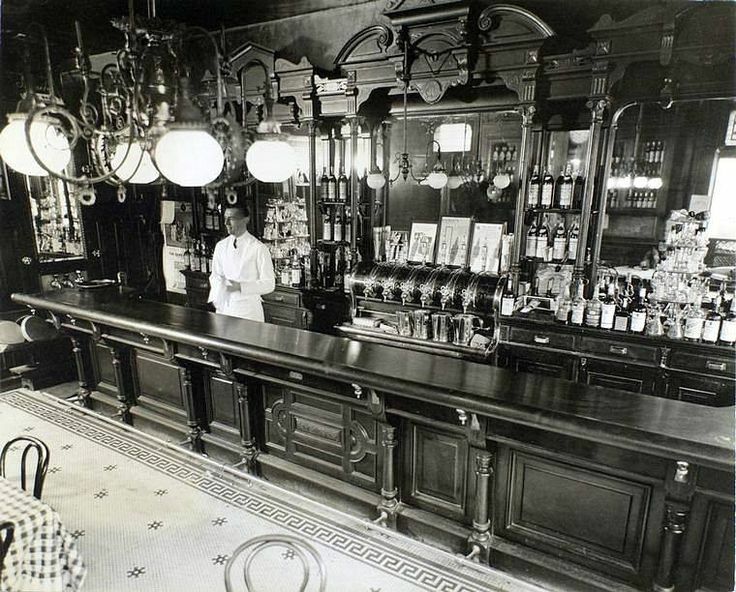 In many pictures of bars in operation not long after Repeal one sees greying, older bartenders, called back to duty for their experience in the saloon era. Above, a younger man is shown in charge. This was New York. Although the furnishings recall an older time, the personnel were probably chosen to appeal to an aspirational, younger demographic. Billie’s was midtown, then as now not exactly a sedate area, it’s always been a happening part of New York. Amongst the older equipment one is taken aback to see beer hand pulls on the back bar – the kind of thing that pulls unpasteurized, naturally-conditioned ale or stout, darling of the craft beer renaissance then and still. One tends to think of England as cask-central in this respect. It was originally but English practice had inspired an American emulation in the mid-1800’s. Ales brewed in New York and environs then were served by hand pump just as they had been in England. However, by the early 1900s ales in the U.S. had become more similar to lagers: cold, fizzy, and clear. The hand pumps in New York and other American cities were mostly taken out of service even before WW I. Certainly it was very rare to see them as late as the 1930s. I suspect the hand pumps in Billie’s of the 1930s may not have been used to pull beer. Under most of the spouts one sees a pitcher. It is possible beer was served by the pitcher, but I think the pitchers may have contained cold water. Kegs of ice water may have been placed where the beer casks used to reside. America always had an appetite for ice water in restaurants – still does. The beer taps may have found a new vocation in an era when pressurized beer service was virtually universal. In fact, at the far left of the image one can make out three faucets which look like beer taps, particularly for their ball-like shape at the top. But who knows… Maybe Billie’s hung on to serving some of its beers the old-fashioned way. In 1930’s America, there was still a surprising amount of ale, porter and stout being sold of English inspiration. This page of brewery historian Jess Kidden shows a large range of these. A few certainly were available in the New York area and Ballantine IPA, say (now restored to the American market after a 20 year gap) may have been pulled in one of those taps. The curved housing for the handles is an old English design, lithos from the early 1800’s show the identical equipment. One can still see the same dispensing unit to this day in McSorley’s, the old Irish bar on East 7th Street, NYC, albeit it hasn’t been used for generations. What’s old is new again, as cask ale has a definite (albeit always minority) presence amongst the ale and stout taps of modern bars that are beer-aware. The style never stopped flowing in England, but it did in North America between about 1914 and the 1980’s. The idea that beer should be fizzy and ice-cold is probably too ingrained in modern society to disappear ever, but some people know that ale at a cellar temperature, with a slight carbonation, and not excessively filtered, is the best way to appreciate beer. I’ll be in New York soon, and will see what’s standing on the location Billie’s used to inhabit. If it was a hostelry that would be nice, but stay tuned in any event. *Note re image: All intellectual property therein belongs solely to the lawful owner, as applicable. Image used for educational and historical purposes. All feedback welcomed.